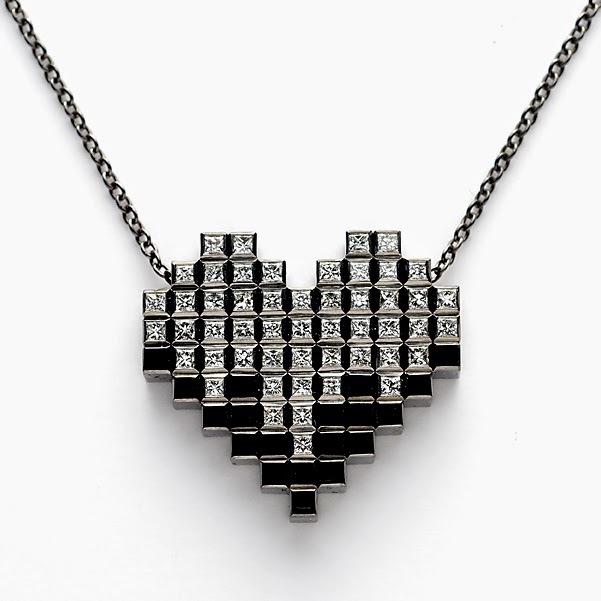 An intriguing combination of digital imagary and fine luxury jewellery, Francesca Grima's pixel heart necklace cleverly adapts the hardened edge of modern technology that inspired this collection into a jewellery that is feminine, elegant and romantic whilst maintaining its contemporary appeal. I admire the cascading effect of the princess cut diamonds onto the blackened gold metal. As well as a pixel effect, it also reminds me of the raining digital code. Labels: diamonds, Francesca Grima, pixel heart necklace, Rock it!